Day, Barry. Sherlock Holmes and the Globe Murders. London: Oberon, 1997. 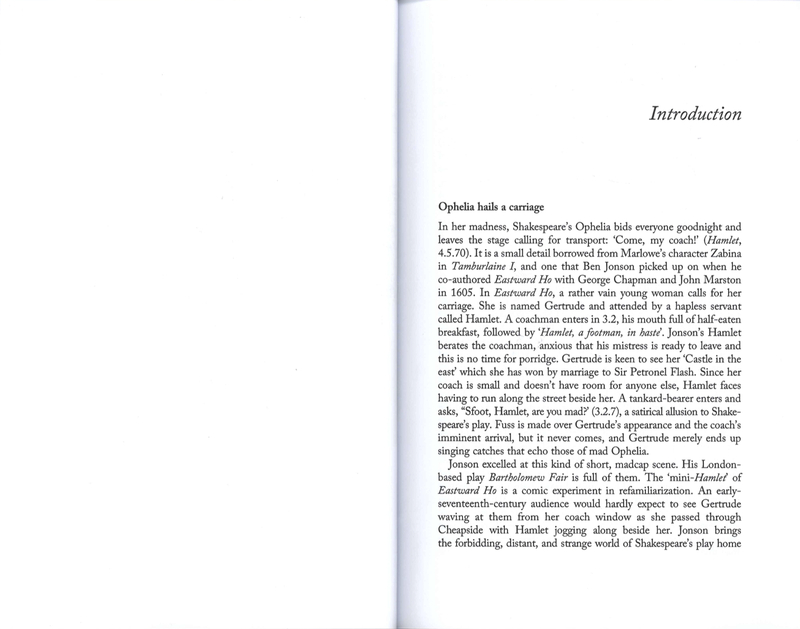 Based on the quality of the book, the quality of the writing, and the excessive number of typos and inconsistencies, I think Oberon Press must be a vanity press—a self-publishing haven. 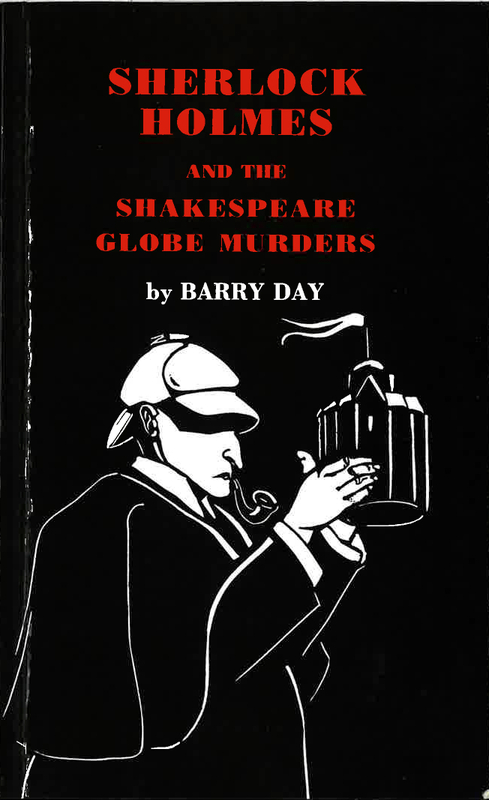 That said, Sherlock Holmes and the Globe Murders is not that terrible. At its best, it sounds like a long-lost Sherlock Holmes novel. At its worst, which is mainly in the dialogue sections, it sounds both cliché and anachronistic. It's the plot that made the novel worth reading. A group in Sherlock Holmes' London is working on rebuilding the Globe Theatre to give Londoners an authentic experience of how many of Shakespeare's plays were originally staged. But not everyone is happy about that—especially the person who keeps sending threatening quotes from Shakespeare plays to the actors and entrepreneurs involved. Then people start dying in ways that are related to various deaths in Shakespeare's plays. It's somewhat reminiscent of the Vincent Price film Theatre of Blood (for which, q.v. ), but with the sharp-eyed detective on the case. It's not a great novel, but it's worth reading as a fun return to the genre of Sherlock Holmes. "Just One Question: Super Bowl Edition." Late Night with Steven Colbert. Perf. Steven Colbert and Tom Brady. Sometime before the 2019 Super Bowl. I'm really putting this up for Shakespeare Geek. A little while before Super Bowl LIII, Late Night with Steven Colbert put out a "Just One Question" segment in which people asked the players . . . well, just one question. 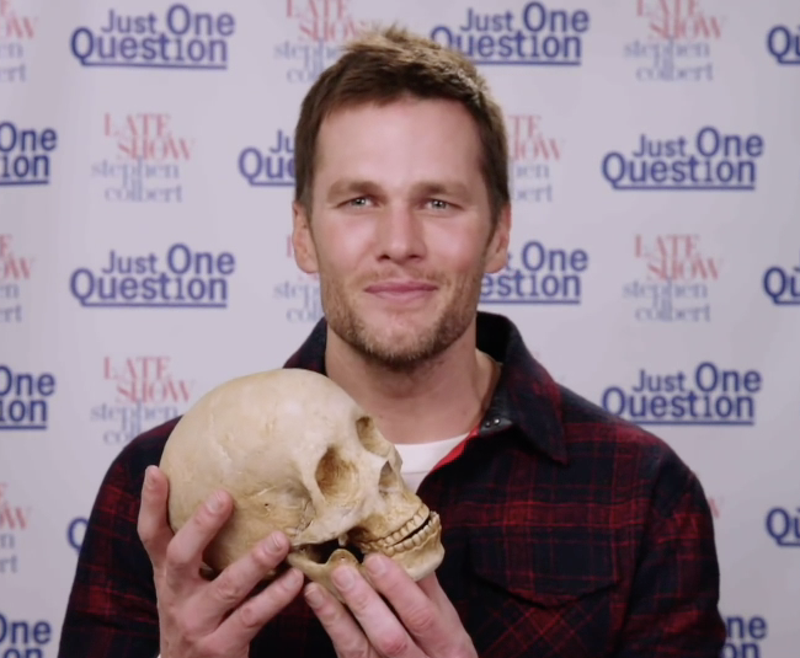 Tom Brady answered his question by indicating his desire to play Hamlet. He then delivered a bunch of lines in a "Shakespeare Acting Accent." 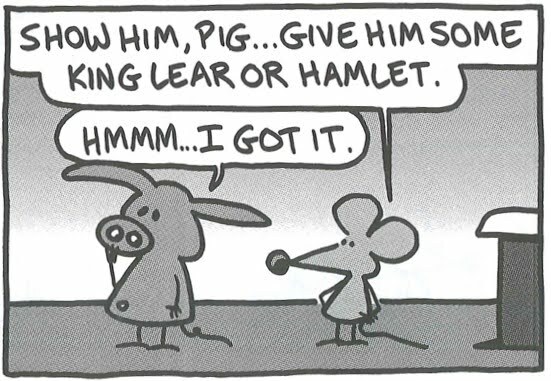 Shakespeare Geek was impressed that he chose to use the Folio for Hamlet's last line rather than Q2, which is the more common choice. 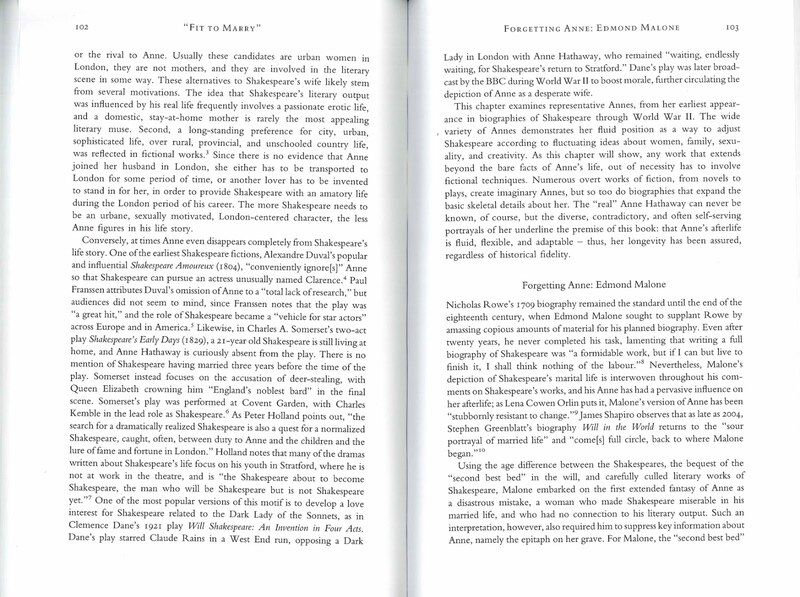 In any case, I've excerpted just the Hamlet sections from the skit. Enjoy! Note: F has four Os; Tom Brady only gives us three. It's an interesting acting decision, and I think it works almost as well as the four-O version. 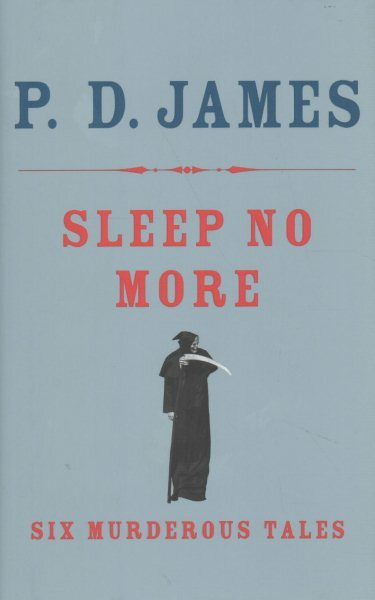 James, P. D. Sleep No More: Six Murderous Tales. New York: Knopf, 2017. Apart from the title, there's not a lot of direct Shakespeare in Sleep No More, P. D. James' collection of short mysteries, but there is one story that I think provides an interesting take on Macbeth. To tell you about it, I have to provide so many spoilers that you'll know most of the story. 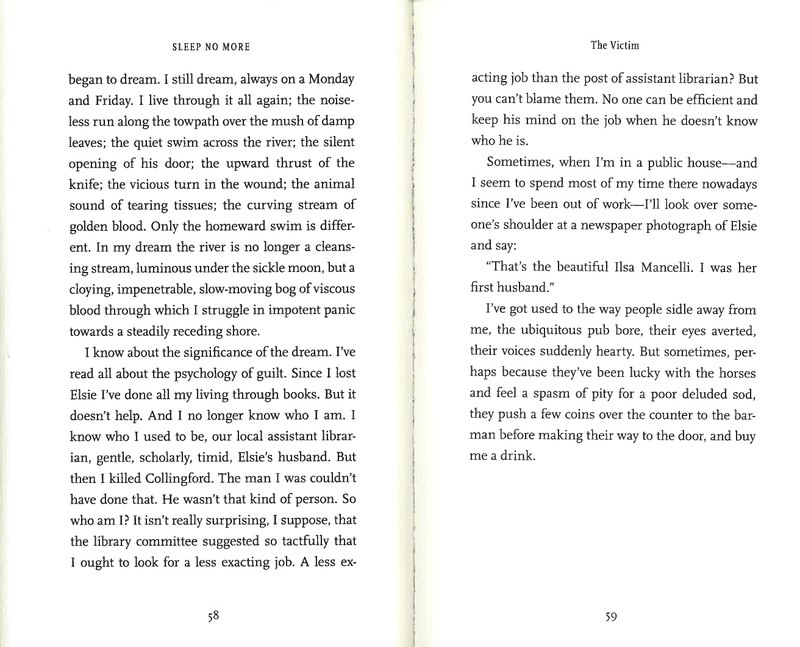 If you don't want to know what happens in the short story "The Victim," pause this blog until you get a chance to read it. Don't worry—this post will be waiting for you when you get back. Everyone caught up (or at a point where they don't mind spoiler)? Good. 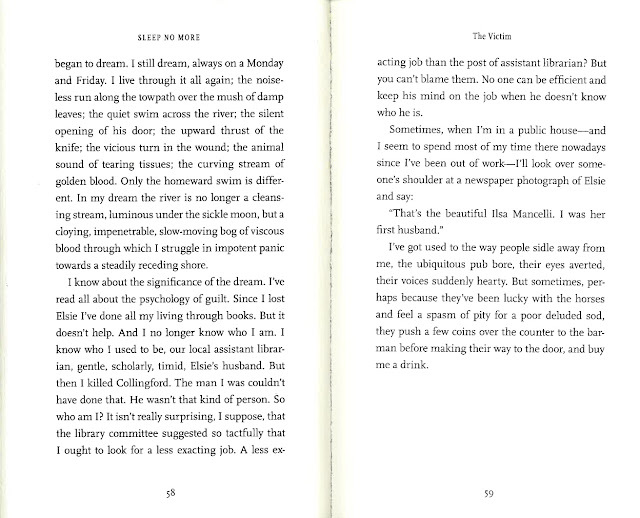 The narrator of "The Victim" is the first husband of a now-famous film star / socialite. 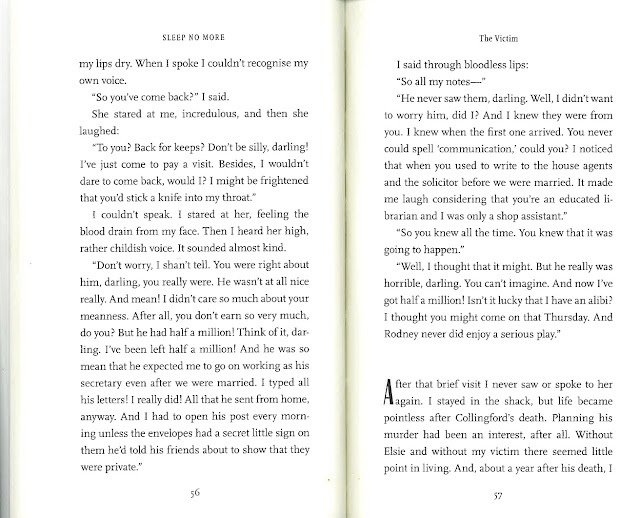 She left him for her second husband, the man the narrator later kills. For months beforehand, he sends threatening notes to the second husband. 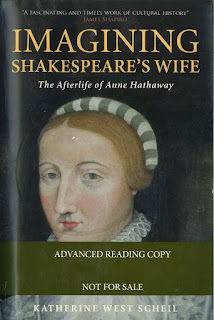 When the police try to figure out who did it, we learn that the socialite has an alibi—she was at a performance of Macbeth at the time of the murder—and the first husband manages to get away without leaving any evidence. The police are suspicious of him, but they are unable to pin anything on him. It's an unsolved case. Three months later, the widow comes to visit her first husband. That's where there's a possibility of a Macbeth connection. 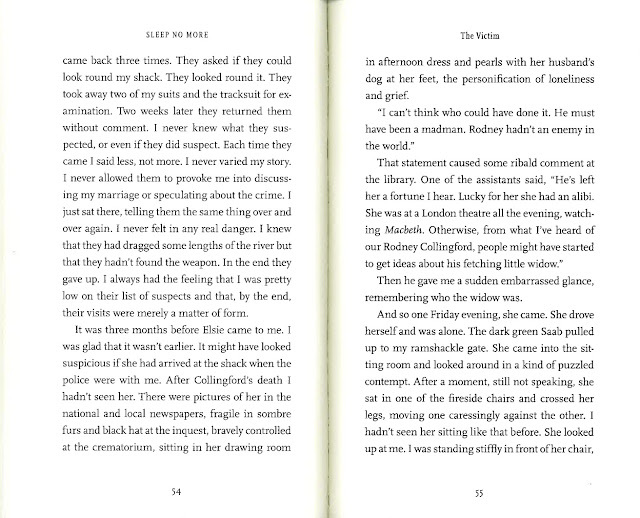 She had received all the threatening letters, knew who they were from, and kept them to herself. She desired his death so that she could be free of him and so that she could inherit his wealth. 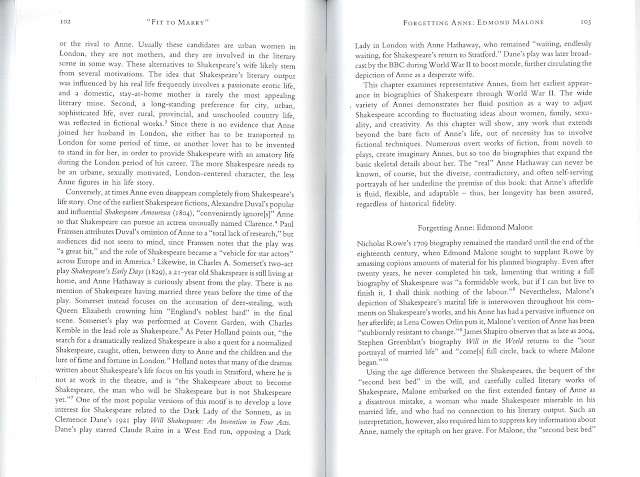 It turns out that she was emulating Lady Macbeth (after a fashion) all the time! “Les on a Ledge.” By Hugh Wilson. Perf. Gary Sandy, Gordon Jump, Loni Anderson, Richard Sanders, Frank Bonner, and Howard Hesseman. Dir. Asaad Kelada. 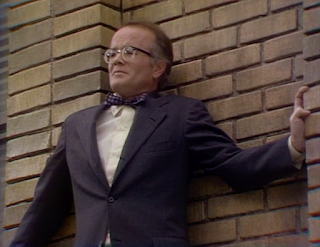 WKRP in Cincinnati. Season 1, episode 3. CBS. 2 October 1978. DVD. Shout Factory, 2014. It didn't take long for the exceptional show WKRP in Cincinnati to turn its attention to Shakespeare. 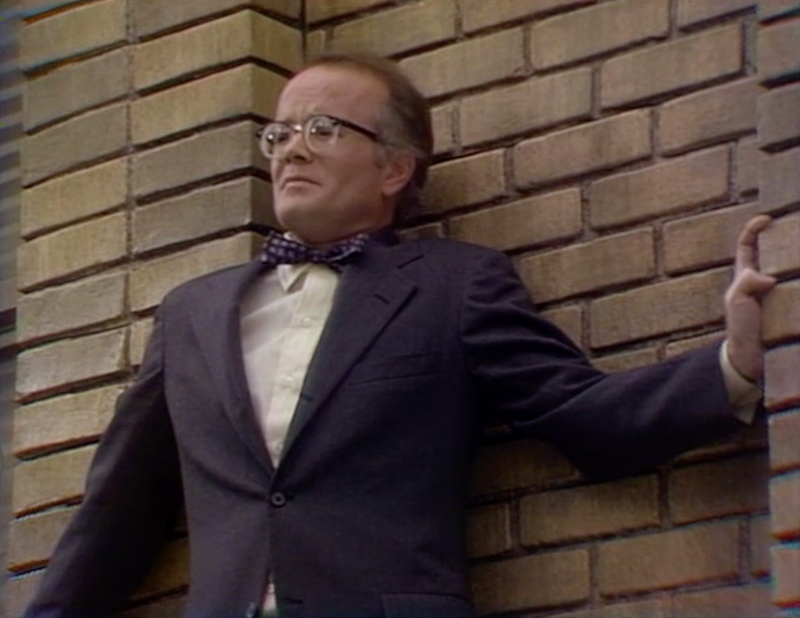 In the third episode, Les Nessman (news director, roving reporter, and hog report expert) is banned from the Cincinnati Reds' locker room because a player assumes that he's gay (he's not). He's upset enough to threaten to jump from the building, to recite lines from Hamlet, and to ponder the meaning of the word "fardel." Schumacher, Julie. 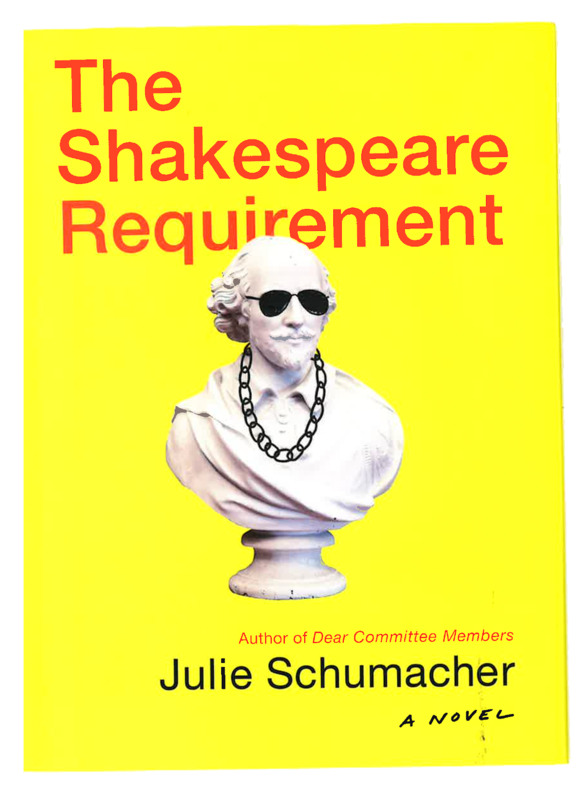 The Shakespeare Requirement: A Novel. New York: Doubleday, 2018. I've read and enjoyed Julie Schumacher's Dear Committee Members, a clever epistolary novel whose plot advances through various letters of recommendation from a college professor. 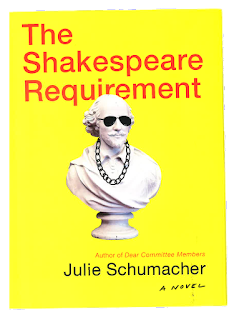 Because of that, I was looking forward to The Shakespeare Requirement, a novel set at the same fictional institution (Payne University). 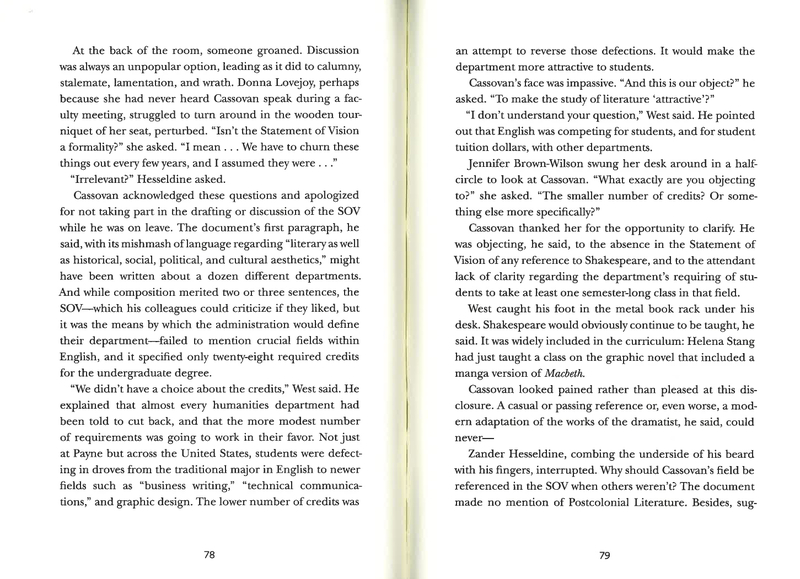 And the concept of the book is particularly telling and relevant. 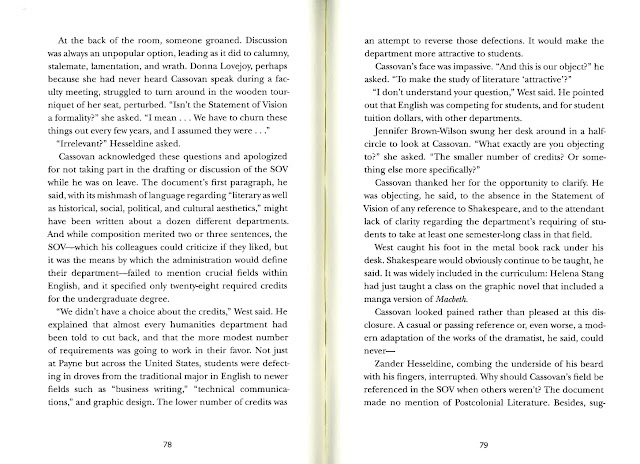 An antiquated English professor refuses to sign off on what is essentially a new curriculum (the "Statement of Vision") for the university's English major because it contains no specific requirement of a Shakespeare course for graduation. The chair has to talk to each of the faculty members and negotiate and compromise in order to pass the curriculum unanimously—and you all can imagine just how hard that might be. And our ancient professor is, of course, determined not to compromise in any particular. It's a good plot, and we gain insight into the politics of the modern university, but I did find the book to fall a bit flat. The plot is somewhat plodding, and there's not much passion in the professors' protestations. Still, it carries itself along—even if the ending is on the anti-climatic side. 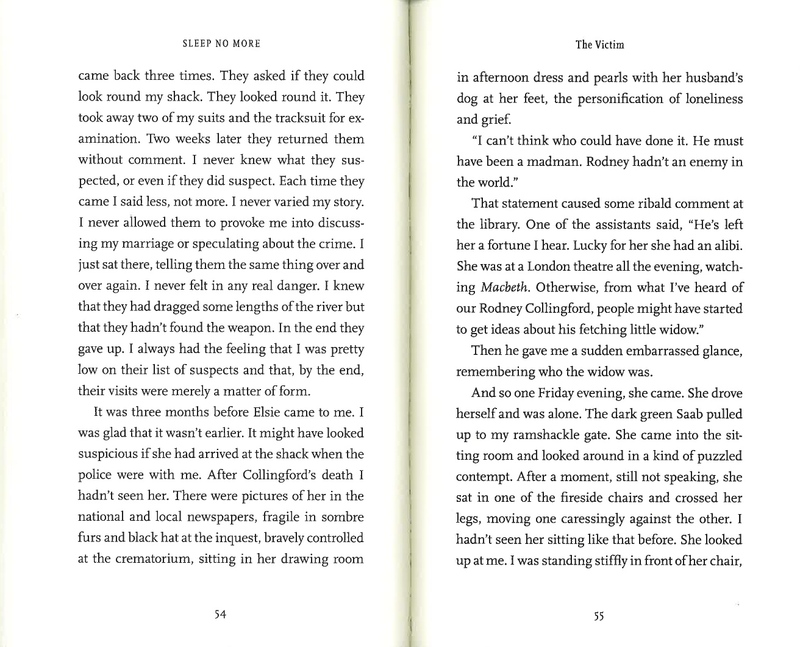 Here's a quick sample set of pages. 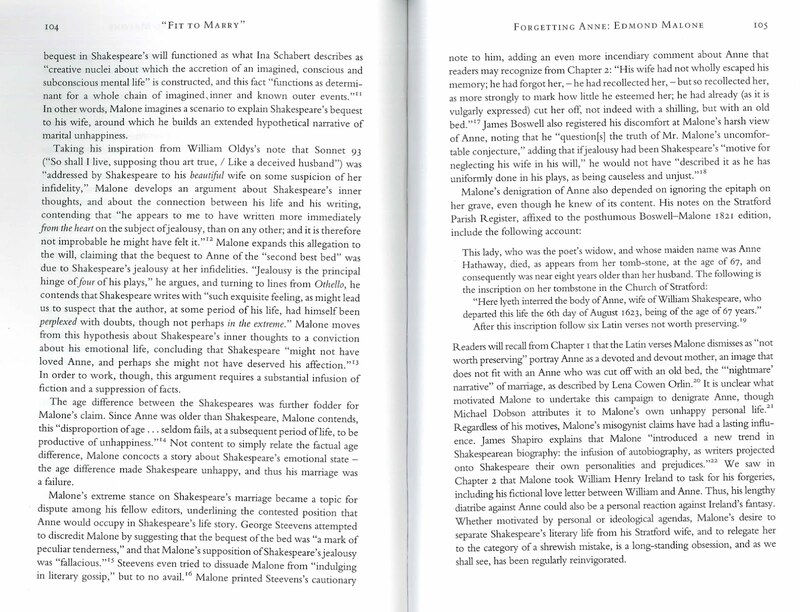 In them, it is argued that Shakespeare is still going to have a place at the university—after all, a manga version of Macbeth is part of one professor's course! Salkeld, Duncan. 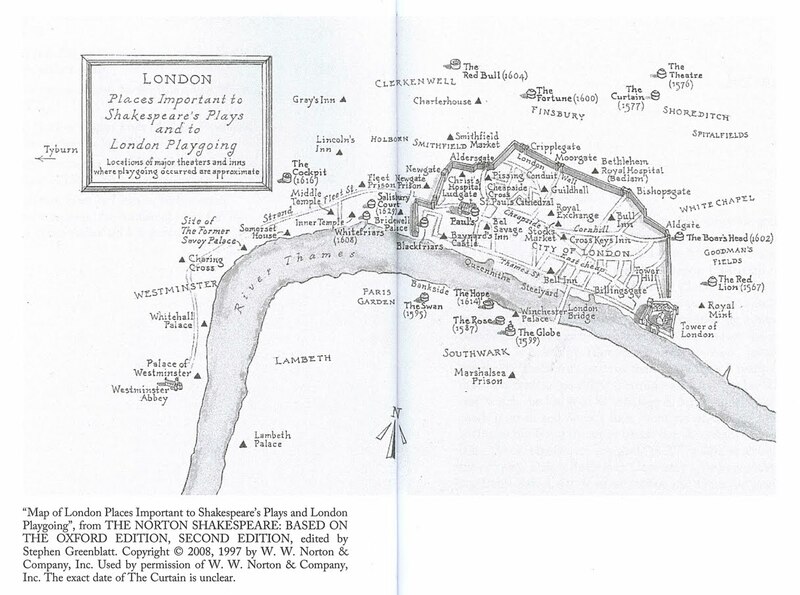 Shakespeare and London. Oxford: Oxford University Press, 2018. 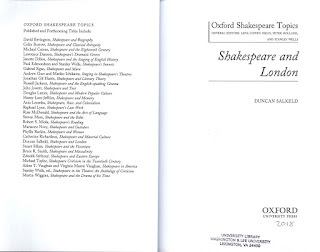 I'd just like to call your attention to this fascinating scholarly work on Shakespeare and London (note: not Shakespeare's London or Shakespeare in London). I just finished reading it, and I learned an enormous amount from it. 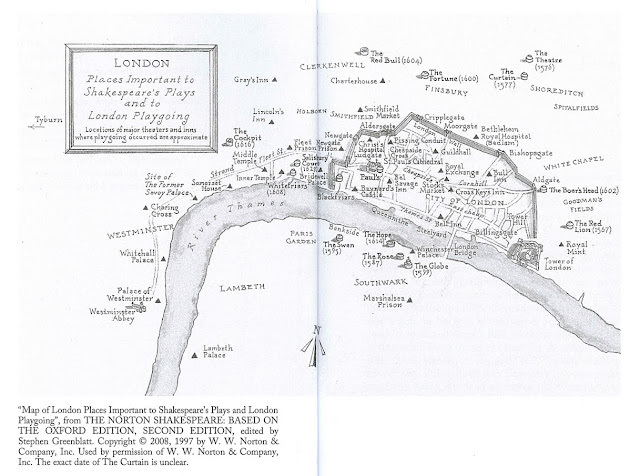 Shakespeare in London relates biographical details of Shakespeare's life, but it connects those to the biographies of others who doubtless surrounded him in London. 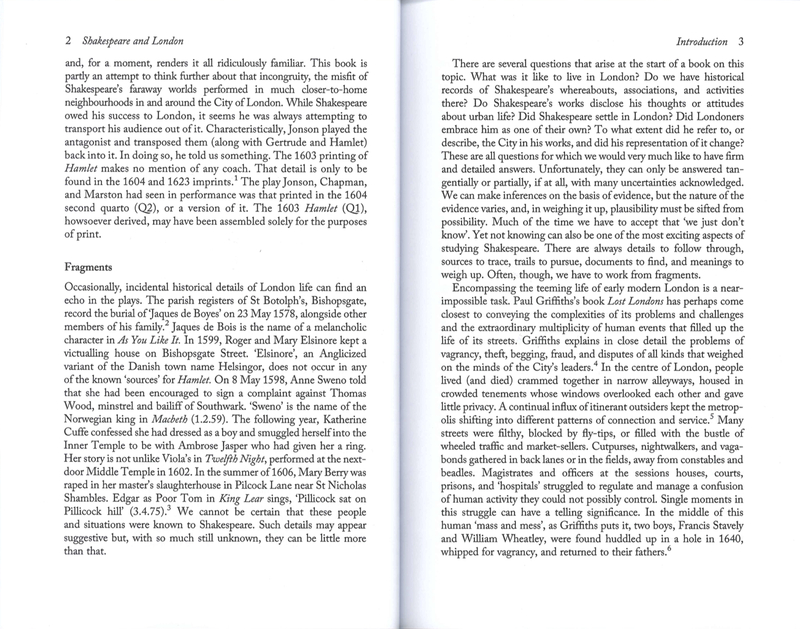 It also tries to find as many connections between London events or personages and Shakespeare's plays. 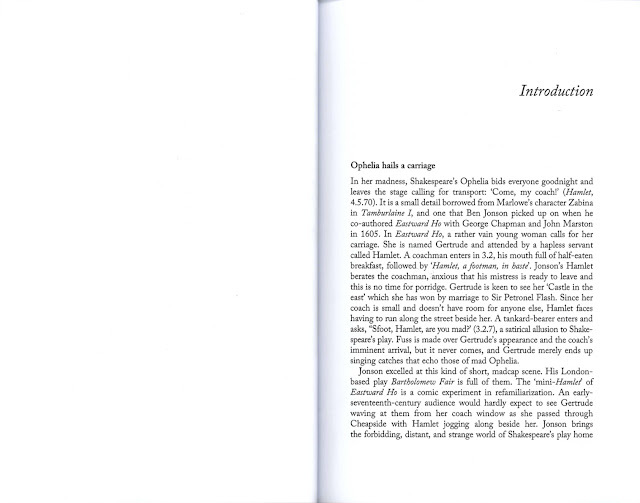 I'm providing a few pages of the introduction to give you a feel for the book. 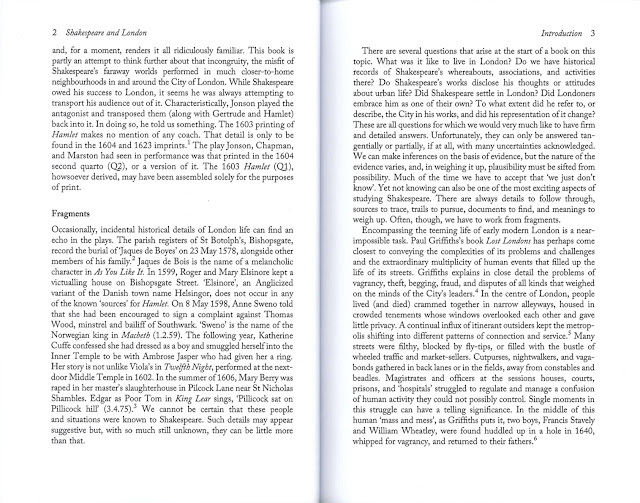 The book then moves on to chapters entitled "Stratford to London," "Places," "People," "Art / Authority," and "Diversity" before bringing the subject to its conclusion. 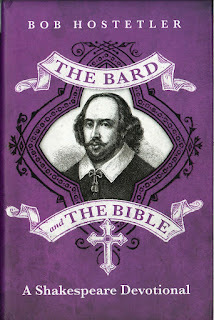 I highly recommend the book as an endlessly intriguing examination of Shakespeare in London and London in Shakespeare. Hostetler, Bob. 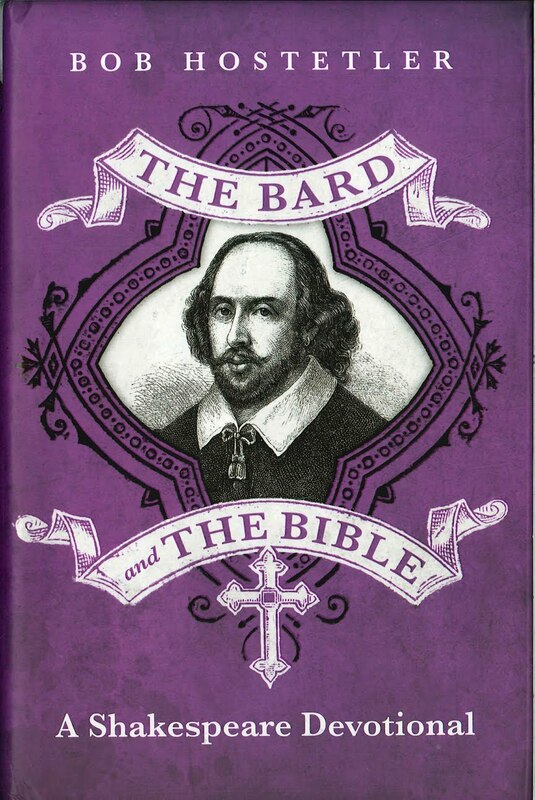 The Bard and the Bible: A Shakespeare Devotional. Franklin, Tennessee: Worthy Inspired, 2016. I was a bit skeptical of this book when I heard of it, but I'm quite impressed. It's a daily devotion that quotes from Shakespeare, provides a relevant passage from the King James Version of the Bible, and then offers some commentary on either the one or the other or the way the two speak to each other. 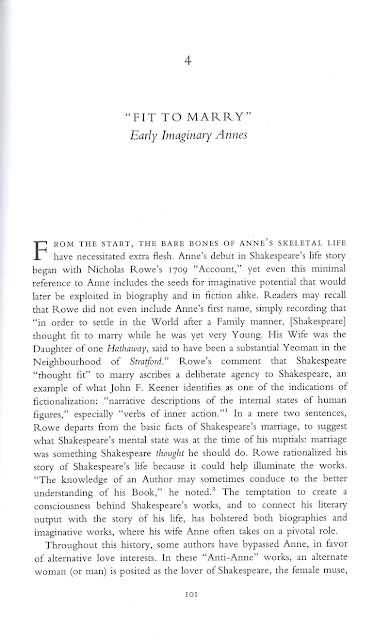 I've been using it in my Shakespeare class this semester, and I think it went well. Before I realized how the book is organized, I was providing the reading for the day of the year. Since the class meets on Mondays, Wednesdays, and Fridays, that meant that I was skipping nearly every other day. It worked much better when I figured out that (generally) each play has its own grouped set of days and quotes from each play progress from early to late in the play. 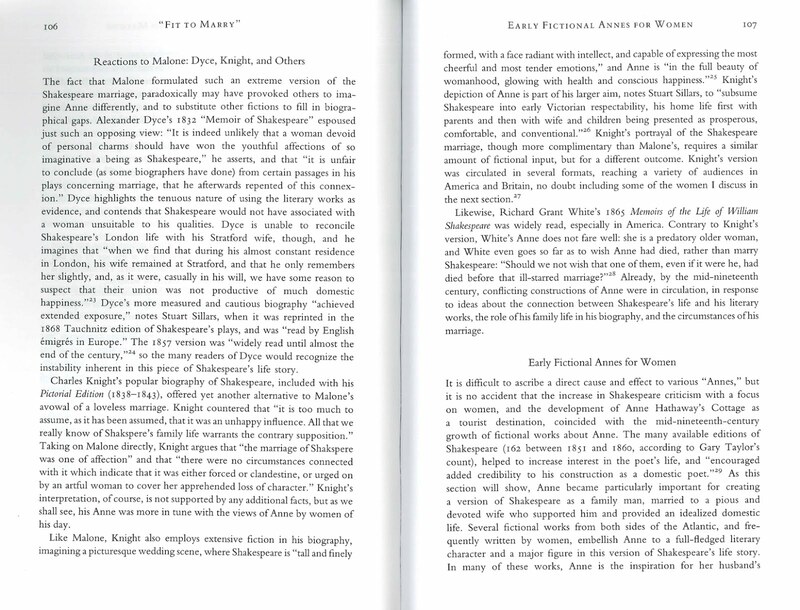 I realized that in time to focus on readings from King Lear during our class on King Lear, and I think that was quite effective. 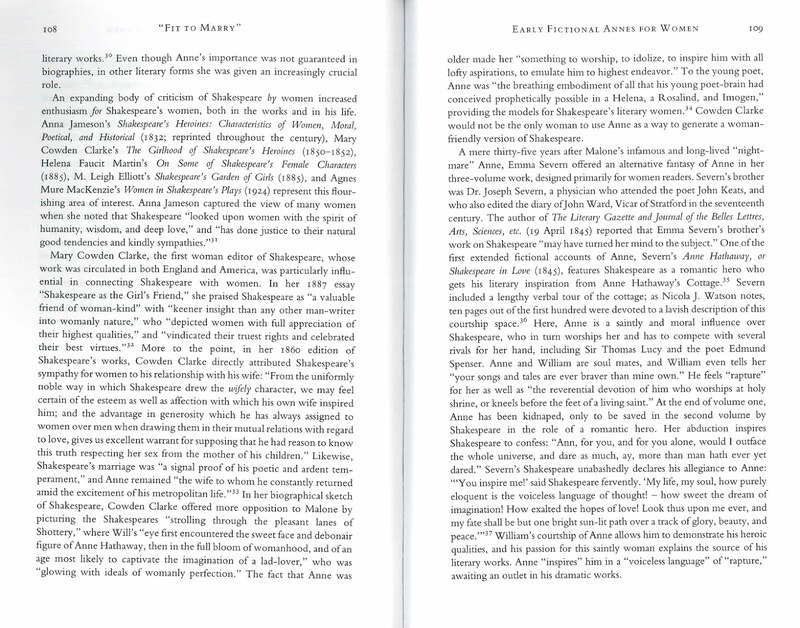 Each reading concludes with an application question and some additional information—sometimes about Shakespeare's vocabulary, sometimes about modern responses to or versions of the plays, sometimes about the world around Shakespeare. 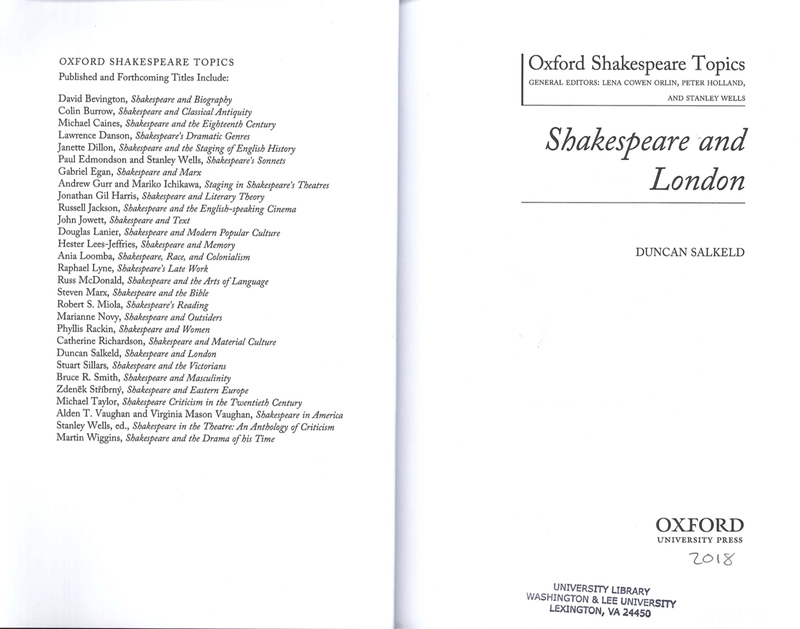 I think I'll use this with a class again, but I'll ignore the days and stick to the plays (in other words, I'll read the Macbeth devotions even if it's February). A Bunch of Amateurs. Dir. Andy Cadiff. Perf. Burt Reynolds, Alexandra Weaver, Elesia Marie, Camilla Arfwedson, Michael Wildman, Charles Durning, Pandora Colin, Samantha Bond, Imelda Staunton, Taz, Lorraine Ashbourne, Gemma Lawrence, Peter Gunn, Tony Jayawardena, Alistair Petrie, Derek Jacobi, and Ciaran O'Quigley. 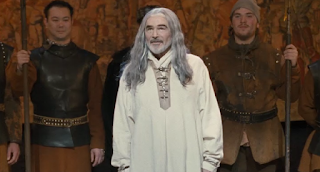 Burt Reynolds in Hamlet and Hutch (for which, q.v.) was pretty disappointing. 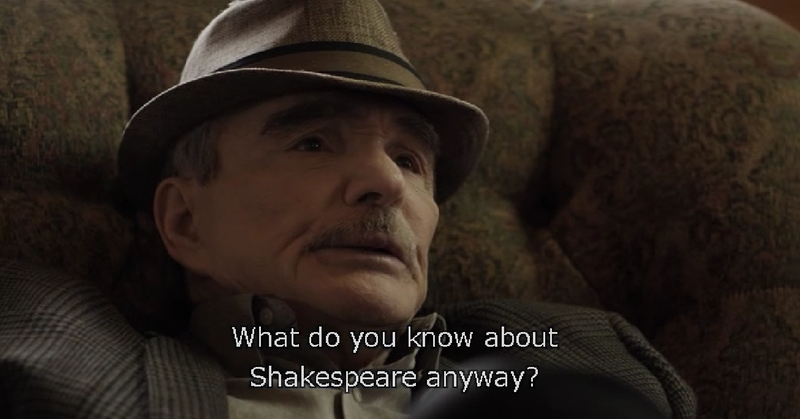 Burt Reynolds in The Twilight Zone (for which, q.v.) was a whole lot better. And Burt Reynolds in A Bunch of Amateurs (for which . . . well, keep reading) is also quite good. I'm very fond of the sequence in the plane. 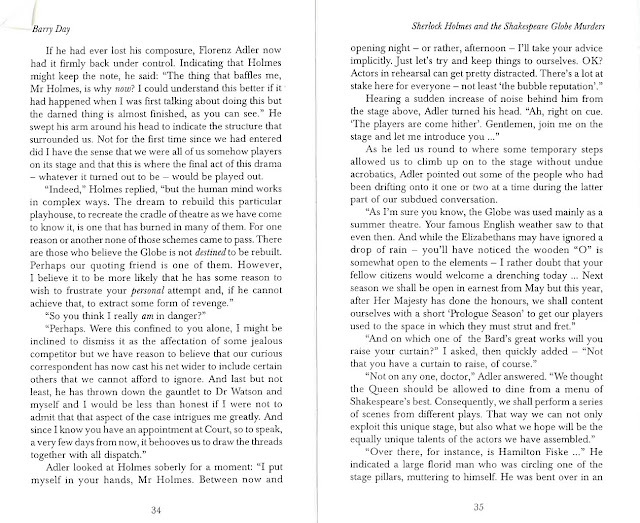 Jefferson Steel goes from the Arden edition of King Lear to the Cliffs Notes . 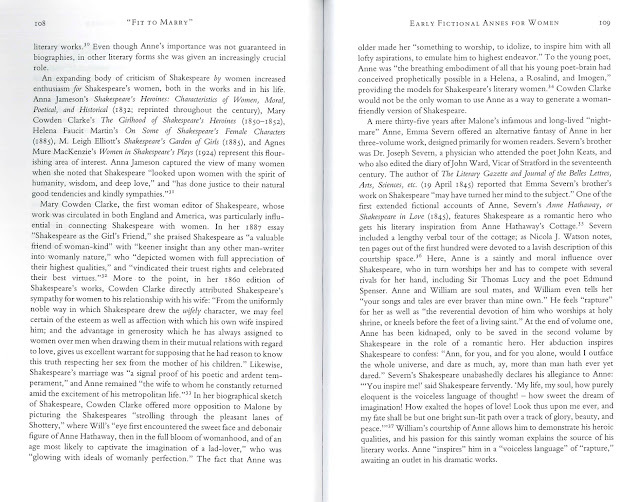 . . to something called "Shakespeare in a Page" printed from the internet. I also love the dramatic irony of the interview. The journalists know he's there to play with an amateur troupe of actors, but Steel thinks, when they talk of amateurs, that they're just being modest about the quality of British professional actors. "Where's Kenny Branagh?" is a great line—especially when he's just met Derek Jacobi and Peter Gunn (who played Fabian in the 1996 Trevor Nunn Twelfth Night). 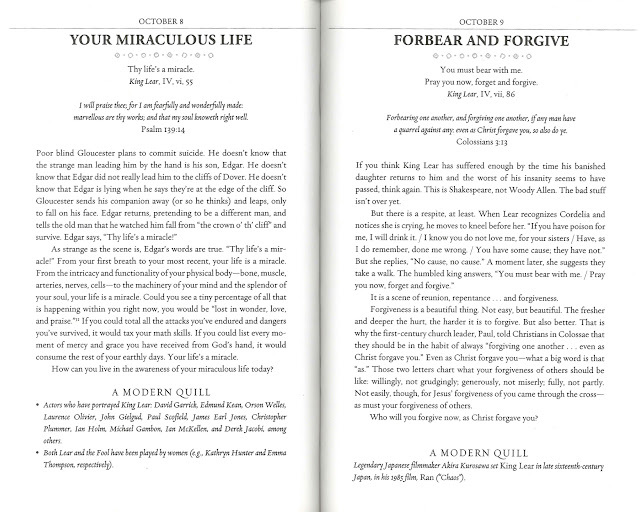 It also makes me think of Branagh's A Midwinter's Tale (for which, q.v. 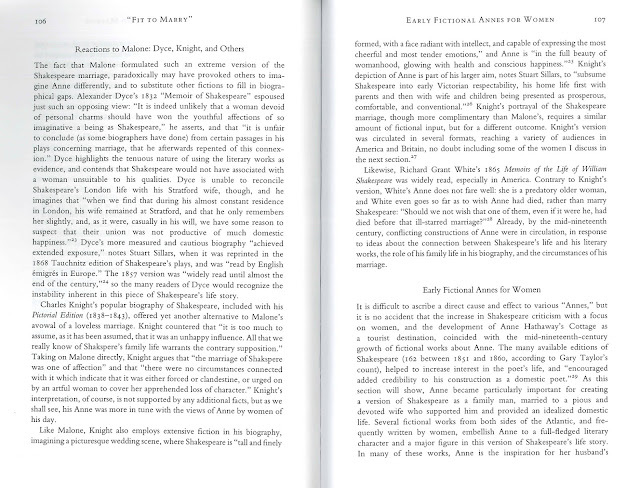 ), which is a similar tale of saving a theatre or rejuvenating a career with a low-budget Shakespeare production. All in all, this was quite a good film, filled with good production values, good acting, good names, and a good Burt Reynolds. It's hard to find in anything but a Region 2 DVD, but it's worth it. Hamlet and Hutch. Dir. Jared Young and Matthew Young. Perf. 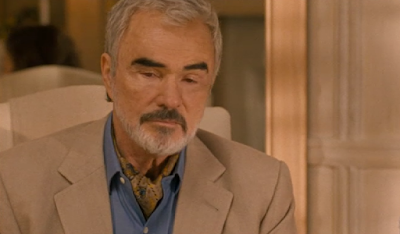 Burt Reynolds, Elizabeth Leiner, and Emma Rayne Lyle. 2017. DVD. Criterion, 2000. Hamlet and Hutch is a pretty forgetful, barely cohesive film about a great-grandfather and his great-granddaughter, a greyhound named Hamlet who almost gets sold to an Alabama racetrack, a theatre that's about to go out of business, and any number of other Saturday-morning feel-good film tropes. Here's a brief take of the plot. Note: Spoilers will follow, but I bet you could guess the ending of this film. Hutchinson Byrne ("Papa Hutch"), the famous Broadway actor, moves to Georgia to be with his semi-estranged granddaughter because he can no longer take care of himself in New York City. His great-granddaughter is fond of acting and films—notably Audrey Hepburn—and soon arranges for Hutch to put on a play in the theatre that her mom is about to sell because she can't afford to hold on to it and run her flower shop. So they get a greyhound named Hamlet for some reason, and then Hutch starts exhibiting symptoms of Alzheimer's. He wanders off, loses the dog, can't perform without the dog, but eventually puts on the show when the dog turns up again. Here are two scenes from the film. In the first, Hutch and Liv trades lines from Shakespeare and Roman Holiday. There you have it! There are a few other bits of Shakespeare scattered through the film, but nothing earth-shattering. 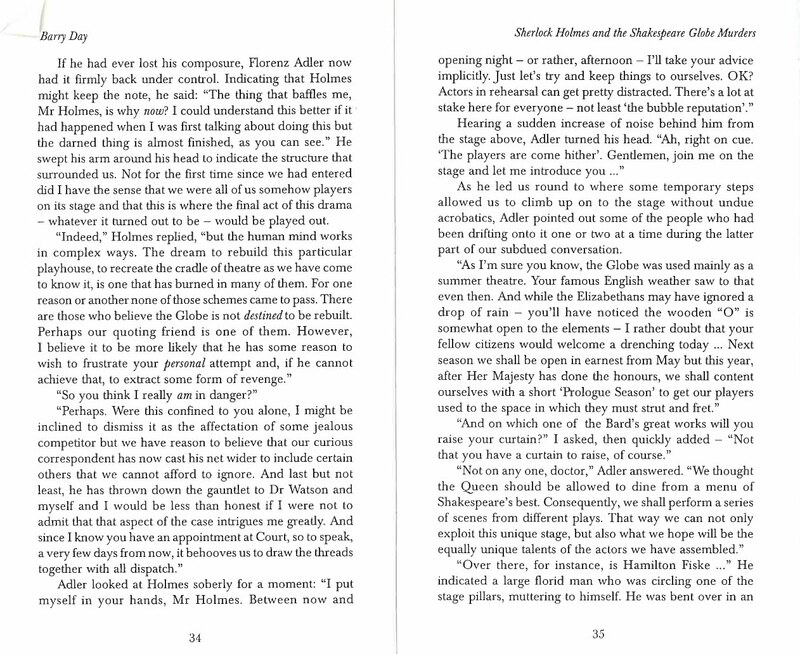 For example, Liv and Hutch read a bit of Midsummer Night's Dream—until Hutch forgets his lines. All in all, it's not a great film, which is both unfortunate and disappointing. If you want a better engagement between Bert Reynolds and Shakespeare, try the Twilight Zone episode entitled "The Bard" (for which, q.v.). I'll be taking a look at another Bert Reynolds film called A Bunch of Amateurs. 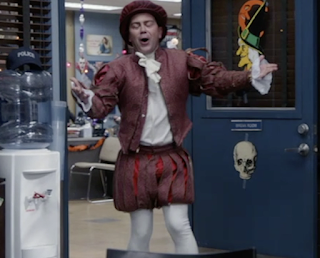 I'm hoping from more and better Shakespeare from it. Pastis, Stephen. BLTs Taste so Darn Good. Kansas City: Andrews McMeel Publishing, 2003. ———. The Crass Menagerie. Kansas City: Andrews McMeel Publishing, 2008. ———. Pearls Falls Fast. Kansas City: Andrews McMeel Publishing, 2014. ———. Pearls Sells Out. Kansas City: Andrews McMeel Publishing, 2009. ———. Sgt. Piggy's Lonely Hearts Club Comic. Kansas City: Andrews McMeel Publishing, 2004. ———. Pearls Gets Sacrificed. Kansas City: Andrews McMeel Publishing, 2015. 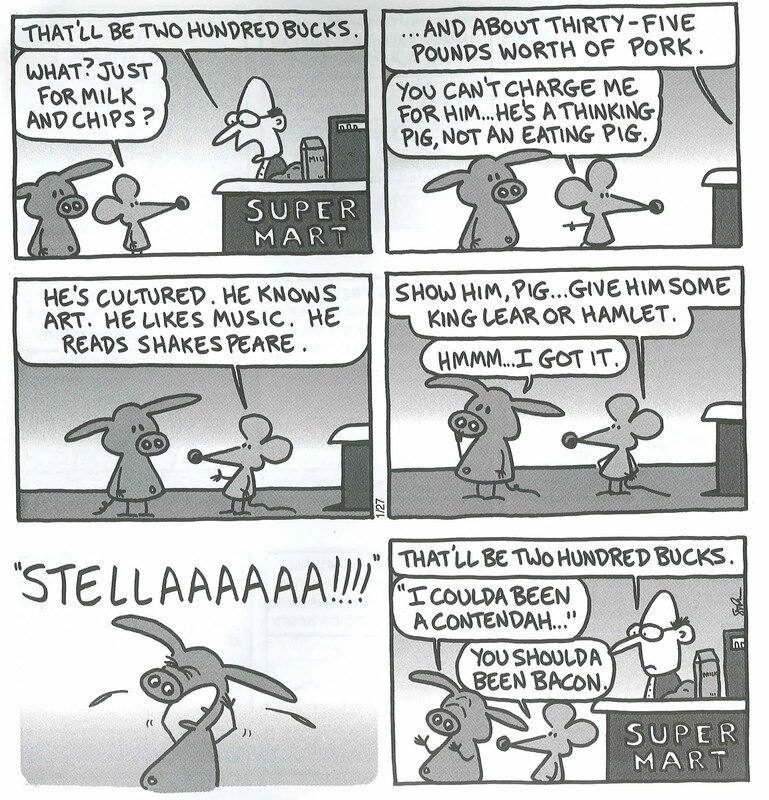 We've seen some good use of Shakespeare in the comic strip Pearls Before Swine before (for which, q.v. and q.v. and q.v. and q.v.). Well, there's even more! I've gathered a few examples from the books listed above. Enjoy! from BLTs Taste so Darn Good. from The Crass Menagerie. 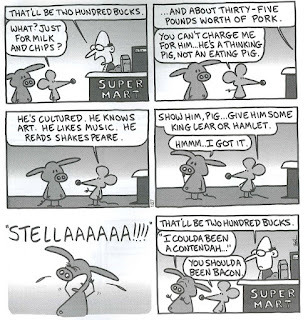 Please note, Mr. Pastis, that you will find some good crocodile material in Antony and Cleopatra. 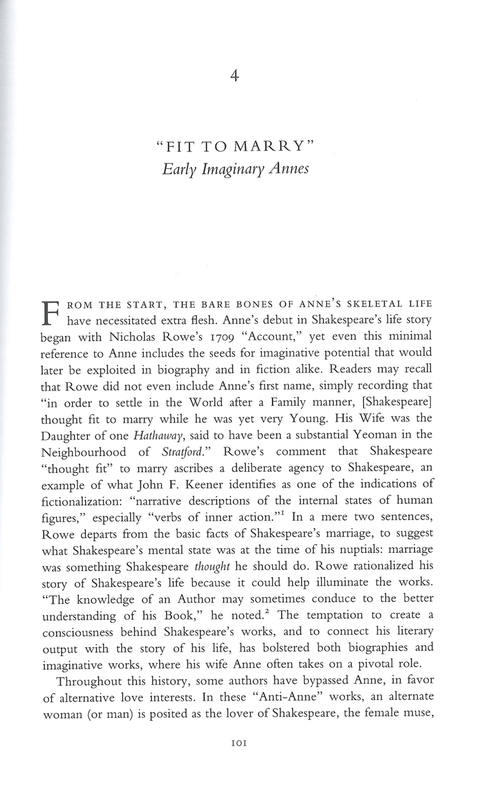 And Hamlet also mentions one! from Pearls Sells Out. 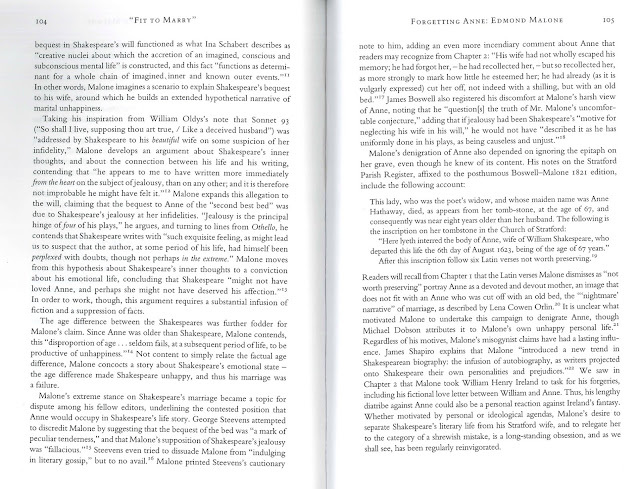 The Shakespeare is really in the annotation rather than specifically in the comic itself. from . . . well, I've lost track of where this one is from, I'm afraid. I'll try to track it down. 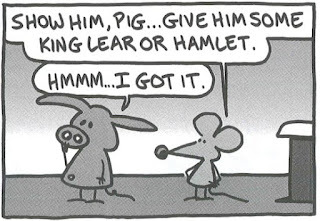 In the meantime, I'll just agree with Mr. Pastis on this one (though I've pretty much always felt that way about the play). from Sgt. Piggy's Lonely Hearts Club Comic. It's not exclusively Shakespearean, but he has his share of cuckold jokes. Thanks, Mr. Pastis, for continuing the venerable (?) tradition. from Pearls Gets Sacrificed. The humor comes in the unexpected cultured quality of Larry the Croc's parents.